The church I am a part of, Westminster Presbyterian Church, hosts an online Bible study, Westminster Reads. Last year we read through the New Testament. This year we are reading through Torah. We are reading the section of Genesis which tells the story of the Flood. It is an interesting story. As I’ve written about, more than once, one of the questions we need to ask when we read the Bible is, “What does this tell us about God?”. We also need to spend some time thinking about what this text might have meant to its original audience. Today, I’d like to ask those two questions about the Flood story. You can (and should) read the story first. It is possible there is more to it than you remember from Sunday School- or that song. (You know the one, “The Lord said to Noah there’s going to be a floody, floody”…. As if the flood was some sort of a fun water park experience. And by the way, I’ve always wondered why we think this story is appropriate to use to decorate children’s rooms. I know, its all the animals. But really if we want Bible animals, how about Isaiah’s peaceable kingdom? I wonder if this story of the flood and destruction is just too frightening for us to take seriously, so we turn it into kiddy songs and room decor? ) But back to the topic at hand. What does this story tell us about God? The story tells us God doesn’t like evil and wickedness. Not such a surprise. The story tells us God is powerful and in control of the elements. Also not a surprise. The story tells us God has regrets. That’s an amazing statement, don’t you think? The story hints that perhaps God makes mistakes, or at least changes God’s mind. Also an amazing statement. What else does this story tell us about God? For most of us, if we are reading carefully this story ought to upset some of our ideas about God. God’s having second thoughts about us? That makes me a little uncomfortable. How about you? The other thing we need to do is to consider what the first audience might have thought about this story. Our inclination is to wonder about the science- was there really a worldwide flood? 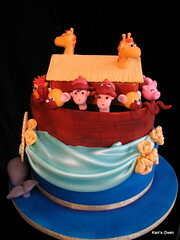 And how did all those animals fit on the ark? And so on… I want to suggest that the original audience might not have spent too much time worrying about those sorts of things. Other ancient people had stories about a flood also. You can read about one story, here. Remember that Israel was a small nation surrounded by larger more powerful nations and surrounded by those nations’ stories of how the world worked and who was in charge. This story of the flood is part Israel’s response to the dominate cultures around them. Israel says, in effect,No Babylon you are wrong. That is not how God acts. That is not the way the world is set up. There is one just, holy God who cares about the world. A God who cares that things are not right. A God who is grieved over wrong doing and suffering. A God who rescues us from the evil and chaos around us. The truth of this story isn’t found in defending a physical, historical flood or in our finding the ark. The truth of this story is the same whether there was a flood or not. The truth of this story is unchanged whether all those animals fit on some big boat. Because the truth of this story is too big to be confined to a vessel of gopher wood. Israel tells the story this way to tell themselves, and now us, about God-the God of Israel. To remind themselves, and us, the gods of Canaan or the gods of the modern world, don’t run things. The world isn’t helpless and subject to the whims of self-serving gods. No that’s not the way the world is. God, the one true, good God, doesn’t create and then walk away. God remains involved. God cares about the world and its suffering. God doesn’t simply destroy and walk away. God commits to this world, imperfect as it is. God commits to engage with and to suffer with this resistant world. This isn’t a simple story of sin, angry God, and punishment. This is a complex story that tells us some important things about who God is. This is not a story about cuddly animals to tell kids. This is a complicated story for adults about a complicated God and a complicated word. *The Torah: A Modern Commentary, ed. W. Gunther Plaut, (New York:Union of American Hebrew Congregations)1981. Posted in Bible, Genesis, God. Tagged Biblical interpretation, flood, God, Noah. Love the point … not so much about history, and no question not science, but as a response to the stories around them. Excellent! Off topic … hope you saw yesterday’s post about the our church’s wine group … pass the idea on! I did see it. Looks like fun! 🙂 …. and it has played a very positive role in building fellowship.